ZEOS 28 wing is very compact in its dimensions. It is mainly purchased for warm water holidays and by persons of slight build, especially women. A more compact wing means less drag in the water, which has a positive impact on the use of air, especially during dives in strong currents. The total displacement of ZEOS 28 wing is 13 kg and it is entirely sufficient, if you use up to 8 kg of the weight. The structure of the bladder may help or hinder reaching the optimal trim. In ZEOS wing the buoyancy center agrees with the gravity center of gas in the cylinder. Perfect trim during the entire dive, regardless of whether your card reads OWD or Full Trimix. ZEOS został tak skonstruowany, by podczas pobytu na powierzchni jak najmniejsza część skrzydła wystawała z wody. ZEOS 28 was built in such a way that when the diver is surfaced, only the smallest possible part of the wing sticks out of the water. Then the bladder displacement is effectively maintained to keep the diver surfaced. 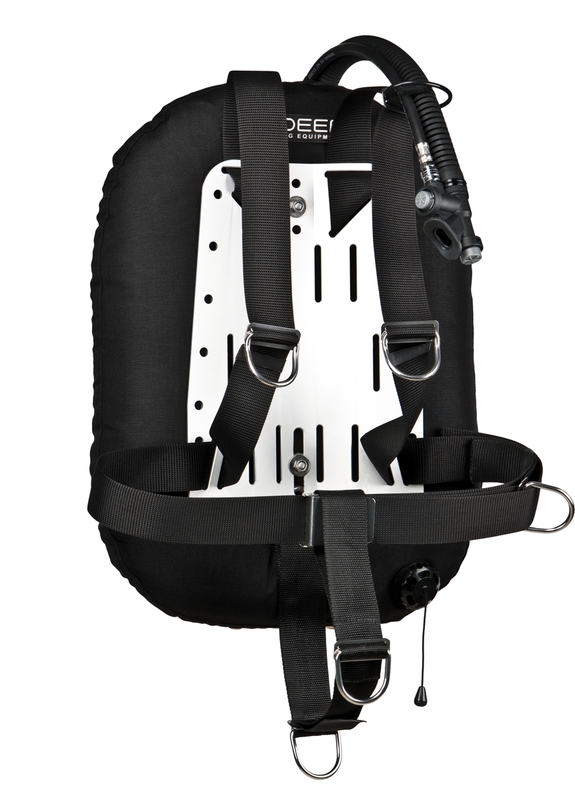 Thanks to such a solution, ZEOS 38 keeps the diver sufficiently high, which is important especially at sea and provides perfect comfort also in high wave environment.